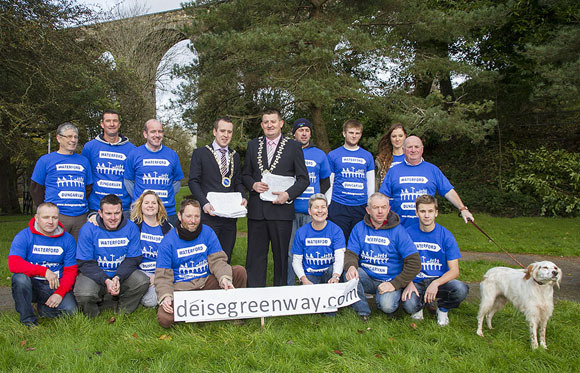 Here some of the crew from Deise Greenway hand over more than 7000 signatures of support for the greenway to be developed, they handed them over to the Mayor of Waterford County Mr Damien Geoghegan and the Mayor of Waterford City Mr John Cummins, in Kilmacthomas Park on Saturday 9th November. This is the first time the two Mayors have met in a public capacity this year so Deise Greenway were at the forefront of the Amalgamation of the City and County. A massive thank you to all who helped and all who managed to sign our support sheets, we know there are still many hundreds (if not thousands) of people who we were unable to get to but thank you for your support and a big thank you to the two mayors.